Published: July 11, 2016 at 11:36 a.m. Updated: July 11, 2016 at 11:44 a.m.
With Major League Baseball's annual Home Run Derby set for Monday night, College Football 24/7's "16 for 16" series takes a fitting look at the game's home-run threats. These are receivers and rushers who can break huge plays from anywhere on the field, and keep opposing defensive coordinators up at night. In some cases, the home-run ability comes in the form of return skills, as well. But regardless of how they do it, each player brings a game-changing quality to the field every Saturday. All long-play stats courtesy of cfbstats.com. Rose returns as the Sun Belt Conference Offensive Player of the Year after rushing for 1,651 yards on 240 carries. That's 6.9 yards per carry, a mark that ranked him sixth in FBS. Against the toughest defense on NMSU's schedule, he broke a 30-yard run and had a 40-yard reception in the season opener at Florida. Those plays were the first of his 10 rushes of 30-plus yards on the year. Rose and FSU's Dalvin Cook tied for the most runs of 20-plus yards in the nation (22). 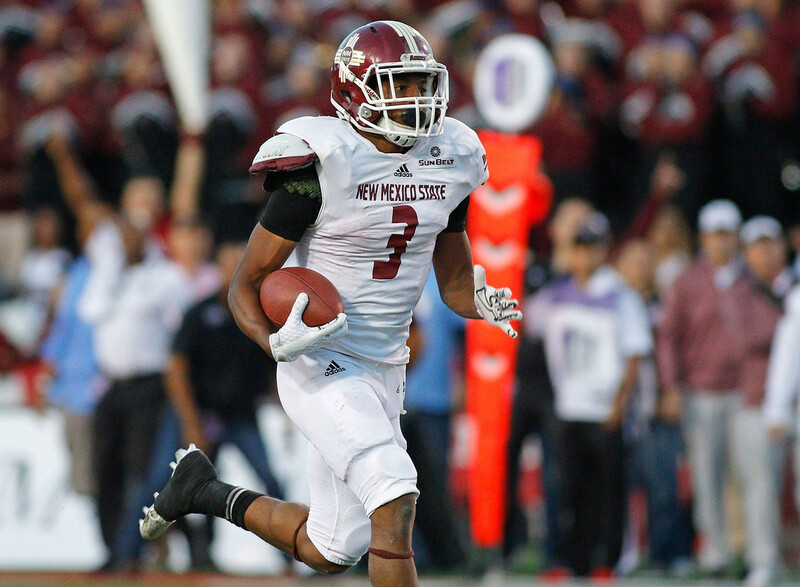 In half of the Aggies' 12 games, Rose rushed for 180 yards or more, including three 200-yard games. In 2014, Pierson-El was among the most electrifying freshmen in college football, taking three punt returns for touchdowns and leading the nation in punt return yardage (596) for a 17.5-yard average. Due to foot and knee injuries, he appeared in just five games last year and made far less of an impact. A healthy return this fall, however, will give second-year Huskers coach Mike Riley not only a highly explosive return man but a budding contributor at wide receiver, as well. Need to flip field position? Find Hollins, who covered a quarter of the field (24.8 yards per catch) when the Tar Heels got the ball in his hands. That average led the entire nation. Hollins had just 30 catches on the year, so his total yardage (745) wasn't on par with some other receivers listed here. But with eight touchdown catches, he made an eye-opening impact on a per-catch basis. With this 91-yard TD catch in 2014, the former walk-on delivered UNC's longest scoring play in Kenan Stadium history. Pumphrey is lacking in size at 5-foot-9, 180 pounds, but he's got big-play ability that translated into more than 2,000 total yards and 20 touchdowns in 2015. His 10 rushes of 30-plus yards made him one of only seven backs in the nation to notch double digits, and four of those went for 60-plus. NFL Media analyst Lance Zierlein sees "exceptional burst to tear around the edge and away from tacklers," in Pumphrey. As well, his average of 14.9 yards per reception is exceptional for a running back. Smith-Schuster's 1,454 yards as a sophomore in 2015 make him the top returning receiver in that category among the Power Five conferences. He broke six receptions of 50-plus yards for the Trojans, opening the year with four of those in his first four games. Against one of the most talented defenses USC faced all year, Notre Dame, Smith-Schuster caught six passes for 139 yards, including a 75-yard score. One of the biggest stars in the Group of Five conferences returns for his final college season having averaged nearly a touchdown per game for his career (36 games, 33 TDs). Last year, he posted 24 catches of 20-plus yards, more than any FBS receiver returning this fall. Davis finished last season with touchdown catches of 80, 76, 72, 65, 30 and 23 yards over his last five games. The Aggies' star introduced himself to college football in a big way last year, breaking a 79-yard punt return for a score and catching a 66-yard TD pass in his freshman debut against Arizona State. As it turned out, it was no fluke. Kirk emerged as the best option in a talented TAMU receiving corps and finished the year with a stunning punt-return average of 24.4 yards. He shredded Arkansas for 173 yards on just eight catches, and took a punt return to the house from 68 yards out against eventual national champion Alabama. Cannon was at the top of CFB 24/7's most explosive list a year ago, and did more than enough in 2015 to be named once again. He's averaged more than 17 yards per catch for two consecutive years, and stretches the field vertically for a Bears offense that will likely rely on him more heavily than ever this fall. Nobody knows Cannon's explosiveness as well as Oklahoma State. Last year, he torched the Cowboys' defense for 210 receiving yards on just five catches (42 yards per catch), including a season-long 71-yard score. Only two FBS wide receivers posted a 1,000-yard season while carrying an average per catch of 20-plus yards last year. One was a first-round draft pick in April (Notre Dame's Will Fuller), and the other was Washington. The Cowboys' star is regarded as the nation's No. 10 receiver by NFL Media analyst Lance Zierlein, who notes Washington "can go get wins in the deep game." McCaffrey can make a big play from anywhere on the field, and he can do it in any number of ways. With defenses game-planned to stop him, the Heisman Trophy finalist still posted the seventh-best yards-per-carry average in school history (6.0). McCaffrey ranked fourth in the nation in rushes of 20-plus yards with 19. He sprung a season-long rush of 70 yards for a score against UCLA, broke a 98-yard touchdown on a kickoff return against Cal, and took a punt return 63 yards for a touchdown against Iowa in the Rose Bowl. Gibson didn't get his hands on the ball as much as many listed here, but he certainly got the most out of his touches. Gibson averaged 24 yards per catch last year, most in the Big 12 Conference and second in the nation among FBS schools (he finished the season with 37 catches for 887 yards). And in scoring nine touchdowns, he averaged roughly a score every four catches. Those touchdowns averaged 44.8 yards each, with all but one of them coming from outside the red zone. Gibson was also very dangerous on kickoff returns, averaging 32.8 yards, including a 100-yard touchdown return against Baylor. Breida has led FBS running backs in yards per carry for two consecutive years despite playing in a fledgling FBS program. In 2015, his 7.92-yard average beat that of No. 2-ranked Dalvin Cook of FSU, by more than half a yard per carry. He led the country or tied for the lead in rushes of 30-plus yards (13), 40-plus (9), 50-plus (6), 60-plus (5), 70-plus (4) and 80-plus (2). He'd cracked CFB 24/7's most explosive list for 2015. He might not face the level of defense that some others listed here do, but that doesn't make Breida any less of a threat for the Eagles. Last year, Taylor was second only to first-round draft pick Corey Coleman of Baylor in touchdown catches among FBS receivers, with 17. He's averaged 17 yards per catch for two years in a row, and his 16 catches of 30 yards or more last season ranked fourth in the nation. NFL Media analyst Lance Zierlein ranked Taylor the No. 6 receiver in the nation, noting he has the speed to effectively get open on vertical routes. Taylor was also named to CFB 24/7's look at the game's most freakish athletes. Ridley stepped in for top-five draft pick Amari Cooper last year and delivered Cooper-like production as a freshman. He's got the speed to take the top off the opposing defense, tying for third in the nation with six catches of 50-plus yards despite playing in an offense that relied heavily on its rushing attack. NFL Media analyst Lance Zierlein describes Ridley as a "human torch", rating him as the top receiver in the nation and noting his unremarkable per-catch average (11.7 yards) is deceiving because of the frequency with which Alabama fed him hitch passes and jet sweeps. As a 230-pound power-style rusher who draws plenty of contact, Fournette ranks among the nation's most explosive players the hard way. His 59 rushes of 10-plus yards last season tied him for first in the nation along with Heisman Trophy winner Derrick Henry, but consider that Fournette accomplished that on 95 fewer carries than Henry, and with defenses keying on him throughout the season. In his most effective stretch of the 2015 season, he broke at least one run of 60-plus yards in four consecutive games. The previous year, he sprung a career-long 89-yard jaunt against Notre Dame in the Music City Bowl. Cook gives the Seminoles an exciting big-play threat with quick feet, exceptional vision and the speed to beat defensive backs in a foot race. Cook's average of 7.38 yards per carry led all backs from Power Five conferences, and he tied for first in the country in rushes of 20-plus yards (22), 30-plus (13), 50-plus (6) and 70-plus (4). NFL Media analyst Daniel Jeremiah described Cook with "home-run ability" who "destroys pursuit angles" and is reminiscent of former East Carolina star and current Arizona Cardinals RB Chris Johnson.